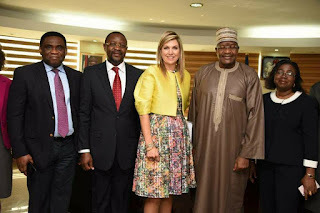 Her Majesty, Queen Maxima of the Kingdom of The Netherlands, has thumbed up telecommuications regulator in the country, the Nigerian Communications Commission (NCC) for its strides and pledging to support Nigeria on issues of financial inclusion, reports ITRealms. Speaking Wednesday in Abuja during the visit to NCC, Queen Maxima, noted she was in Nigerian as part of her global itinerary for advocacy on financial inclusiveness to enhance individual and national development. She also commended NCC’s robust regulation of telecommunication services in Nigeria, its collaboration on national financial inclusion strategy, and promised to support Nigeria to achieve greater safe, sound and sustainable financial inclusion. The Queen, ITRealms gathered visited the Commission in her capacity as the Special Advocate of the United Nations’ Secretary General for Inclusive Finance for Development, was received with NCC’s renowned warmth and enthusiasm by the Executive Vice Chairman of the Commission, Professor Umar Danbatta, who led other management staff that include the Executive Commissioner Stakeholder Management, Mr. Sunday Dare. Accordingly, Prof. Danbatta available statistics demand a strategic response to ensure greater financial inclusion in Nigeria, and recalled that Nigeria’s National Financial Inclusion Strategy is set to reduce the percentage of the financially excluded adult population in Nigeria to 20 percent by Year 2020 – as at 2016, about 40.1 per cent of the Nigerian adult population are financially excluded. The EVC informed the Queen that NCC is very much committed to the actualization of the National Financial Inclusion Strategy. “Just recently, the final draft of a Memorandum of Understanding between CBN and NCC was signed, and the CBN-NCC Joint Technical Committee on Mobile Money has instituted processes that will ensure that Mobile Network Operators (MNOs), register Special Purpose Vehicles (SPVs), to enable them become Mobile Money Operators (MMOs)” Danbatta declared. He praised the Queen for her global efforts at promoting financial inclusion and noted that Her Majesty has been “a leading global voice advancing universal access to affordable, effective, and safe financial services”, a worthy duty and service which Her Majesty’s commitment to is further demonstrated by the visit to Nigeria and the Commission. The Queen commended NCC for its numerous regulatory strides and in particular the Commission’s collaboration with other stakeholders especially the Central Bank of Nigeria to ensure greater financial inclusion in Nigeria. She said she was in Nigeria in 2012 when the National Financial Inclusion Strategy was instituted and prayed that Nigeria is able to sustain the ongoing collaboration to ensure the achievement of the Strategy targets. Her Majesty cited Mexico among many nations that have made giants strides in rural connectivity, which is a critical backbone needed to enhance financial inclusion and terms of the identity factor which is also central to financial inclusion programmes, the Queen expressed delight that the National Identity Management Commission is on the right track in discharging its component of the responsibilities towards attaining greater financial inclusion. On Her Majesty’s delegation is Seb Molineus of the World Bank; Sebnem Sener of the Office of the UN Secretary General’s Special Advocate for Financial Inclusion; Dr. Michael Wiegand of Bill and Melinda Gates Foundation, all of who spoke about the potentials of Nigeria and the need to move steadily and quickly towards ensuring financial inclusion for all. Also on the delegation is Nigeria’s Dr. Abi Jagun, the Programme Officer of the Bill and Melinda Gates Foundation’s Financial Services for the Poor. Her Majesty Queen Maxima of The Netherlands - mother of three, graduate of economics, and former investment banker – was appointed in 2009 as the Special Advocate of the United Nations Secretary General on Inclusive Finance for Development. Pix; Queen Maxima in a group picture with EVC, Prof. Danbatta with some top management staff.